qui sera retiré du service sous peu, selon un porte-parole de la marine. Bombay en août 2013, lesquels ont coûté la vie à 18 marins. La frégate INS Betwa (F39) se couche sur le flanc en voulant sortir de cale sèche ! 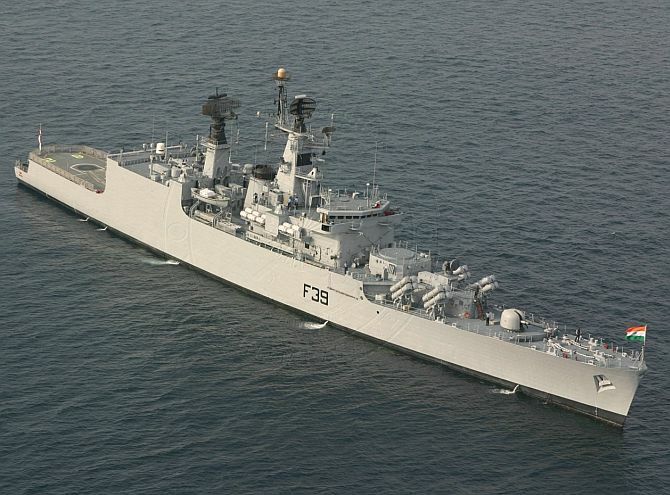 INS Betwa, a front line Brahmaputra-class frigate of the Indian Navy, which was undergoing refit at the Naval Dockyard in Mumbai slipped on the dock blocks while the vessel was being undocked around 1.50pm on Monday. Two sailors are reported to be missing. Search operations to track them are underway . Fourteen sailors suffered minor injuries in the incident, said Captain DK Sharma Indian Navy spokesperson. While an enquiry will be launched into what exactly caused the vessel to slip, the extent of damage is being assessed by navy officials. Explaining the situation, Captain Sharma said that the 126-metre-long, 3,850-tonne ship, tipped over while it was being undocked. The mast of the ship hit the dockyard ground, he said. INS Betwa had run aground in January 2014 and collided with an unidentified object that led to a crack in its sonar system, and had also seen saltwater ingress into sensitive equipment.